Can you handle another nickname? Somehow, over the years, the ubiquitous "Anne Banana" morphed into Eenie Bean. And it stuck. I've been answering to it for at least 30 years. Gotta love family! I enjoyed knitting these and hope to have the opportunity to wear them this week as we head into fall here in New England. As soon as I opened the Fall issue of Interweave Knits, I knew I would knit the Minimalist Cardigan. Having recently catalogued most of my stash over on Ravelry, I decided I had no excuse to buy new yarn. Shocking, yes, I know. However, I think I found something suitable. I'm using some Hemp Yarn that is 55% hemp, 45% cotton. 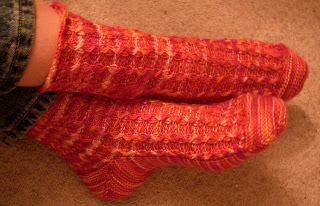 I scored this yarn at the HCSS Yarn Swap last year (or was it the year before...?) and thought it would add some interest to my wardrobe with the bonus of being machine washable. Of course, gauge is vastly different, but I think I've got it under control. 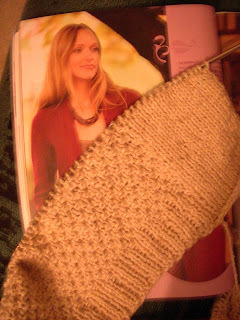 I'm 5 inches in and while I can only knit with this inelastic yarn in short chunks, I'm loving the results so far. That is going to be a sweater that you will wear and wear and wear. It is looking so good! Is that stitch hard or rather time consumer for a non-continental knitter? Just curious. Consuming- I meant to type consuming duh,,,it's a little early in the am for me! Love the socks! That cardi is definitely on my list too.